Limo Baltimore has the best fleet of luxury vehicles in town! We feature a large variety of limousines and party buses that will add a touch of class to any occasion. We pride ourselves in our customer service, and we know that you will enjoy working with us. Many of our customers have worked with us before or have been referred by previous clients. We realize that there are so many great things to see and do in the Baltimore area and it is important that you keep in mind that your mode of transportation can make or break your experience. We know that there are some outstanding destinations that you are not going to want to miss including the National Aquarium, Fell's Point, Fort McHenry National Monument and the Baltimore Museum of Art just to name a few. And when you ride with us to check these amazing sites out, you will never look back. 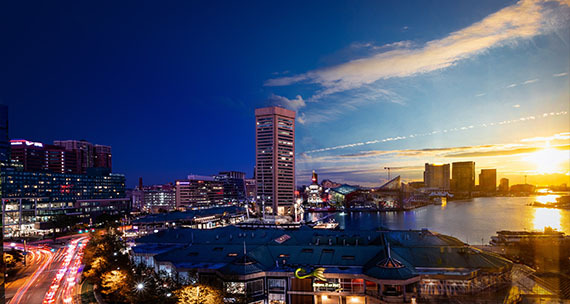 Baltimore is a wonderful city filled with restaurants, bars and clubs, landmarks and other sightseeing opportunities, professional sports teams, and more. There is no better way to explore it all than from a Baltimore Limousine or party bus. You and your guests will have the time of your life and will remember the experience for years to come! And there truly is no other way to travel when you have exciting plans in the area. Some have tried and realized that trying anything else is an epic fail. For instance, some people have believed that carpooling would be an acceptable means of transport. We cannot tell you enough how wrong this plan would be if you want to have the time of your life. Think about it, by carpooling you would have to break up into small groups and cram into small vehicles. Each vehicle would have to fight through traffic and eventually find parking spaces that hopefully are in a close enough proximity that your group can come back together again. And this process would repeat itself over and over again as you head to new destinations. Some of your group will be designated drivers which means that they will not be able to partake in their favorite libations. And you can forget about the convenience of being close to your destinations. Now, this doesn't sound like a lot of fun to us. But when you ride on a Baltimore Party Bus, not only will you have access to the best toys around in order to keep the party going while you travel, your whole group will be together for your entire experience and you will be dropped off right by each venue as well as picked back up at the same location. Now you see why riding with us makes a huge difference. We look forward to working with you. Our customer service representatives are standing by to answer all of your questions about our service and company, give you a quote, book your reservation, and help you with anything else you might need. But before you contact one of our representatives, we highly recommnend that you peruse our entire website and learn as much as you can about what we do from our pages. Have a notebook and pen nearby as you do in case you need to jot down a question that crops up. When you feel that you have gleaned as much as you possibly can from our website, contact our well trained customer service office. Our affable and very knowledegable customer service specialists are available 24/7, 365 days a year for your convenience. We promise you that we will never pressure you into making any kind of decision. If all you want to do is talk to us and ask questions, we will be happy to do so for as long as you would like. When you do feel like you are ready to take the next step, one of our customer service respresentatives will be more than happy to walk you through our easy and painless booking process. Don't worry, our agents are experts at fitting groups to the perfect vehicle. So, when you are ready, call or email Baltimore Limo today! We look forward to talking with you and to talking about the possibilities. Many people ask us why we are the best company in the luxury entertainment transportation industry. It is a great question and one that we love answering. Much of our success has to do with our attention to detail in many different arenas. We realized from the very beginning that if we were ever to be considered the best transportation solution, we would need to have the absolute best vehicles in our fleet. And that is exactly what we acquire, high quality vehicles. Once they are in our fleet, we then install some amazing amenities and features that will help the party to keep going for as long as you ride. Our company also stresses safety. We want to make sure that everyone gets to where they want to go in one piece. So, with that in mind, we have certified mechanics on staff who regularly inspect and maintain our entire fleet. What this means for you is that the vehicle you are interested in will be road worthy when you need it. it also means that you will not have to worry about being left stranded on the side of the road or not making it to your destinations. Baltimore Limo hires professional detailers who meticulously clean every inch of our interiors between uses. This means you will be stepping into a pristine environment. In terms of driving, we only hire certified and experienced drivers who know the area roads really well. And all of our vehicles are equipped with GPS which means that there will be no getting lost. Now you know why we are the best of the best in the luxury entertainment transportation industry. We look forward to working with you and to fitting you into a Baltimore party bus.